Not everyone can be a regular bike commuter. Some folks live too far from work, some have erratic schedules, some would have to traverse dangerous roads or brave adverse weather conditions, and others – including yours truly – work out of a home office. But even if you don’t bike to work, you can still bike regularly. In fact, it can be a singular source of pleasure – few things in life beat whooshing down a hill with the wind in your hair. Biking is also part of a healthy, happy lifestyle – according to the state government of Victoria, Australia, the benefits of regular biking include stronger bones, more flexible joints, lower stress and anxiety levels, lower body fat levels, and better cardiovascular fitness in general. So, what if you enjoy biking but don’t own a bike? Depending on where you live, that might not be a problem. Many sizable cities now have bikesharing programs that offer affordable short-term rentals throughout a defined geographical area. These may be run by private companies, educational institutions, municipal agencies, or public-private partnerships. The first bikesharing programs began in 1960s Europe, but the concept didn’t take off worldwide until the mid-2000s. In North America, they tend to be affiliated with municipal governments, though some programs, particularly in small college towns, center on university campuses. 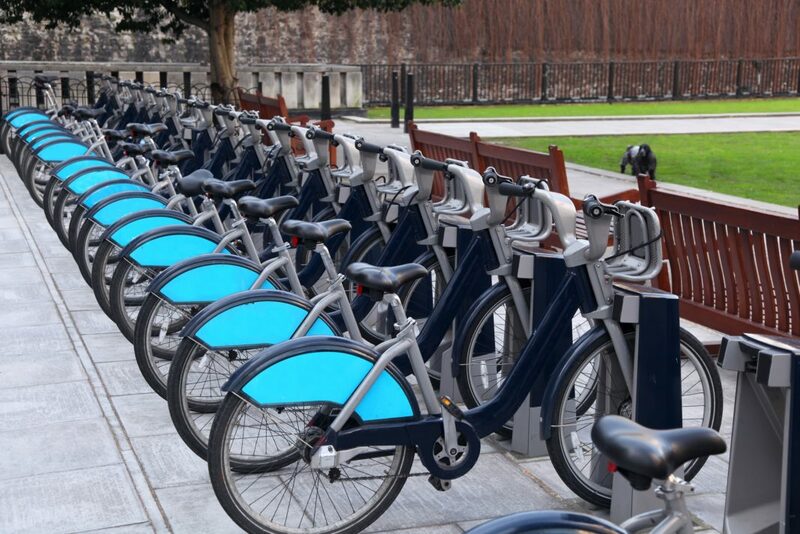 The typical bike share has several defining characteristics and features, including station-based bikes and payment systems, membership and pass fees, and per-hour usage fees. Programs are generally intuitive enough to facilitate a manageable learning curve for novice users. And, despite some variation, the differences are usually small enough to prevent confusion when a regular user of one city’s bike share uses another city’s program for the first time. Bikes and stations are the most important physical elements of any bike share program. The actual bikes are typically a standard size, color, and configuration. Colors are usually bright – the two-tone color scheme used by Nice Ride Minnesota, Minneapolis-St. Paul’s program, is solid blue and grassy yellow-green. Branding is often prominent as well, with many programs prominently displaying the corporate logos of big sponsors on the frames. The bikes themselves tend to be bulky (more than 40 pounds in some cases), with robust, high-set frames that look very different from typical road or mountain bike frames. In all, bike share bikes are usually difficult to mistake for regular bikes. Meanwhile, stations are essentially high-tech bike racks with an adjacent payment kiosk. Each station has a number of docks (anywhere from 10 to 100 or more, depending on local traffic volumes) used to store and lock bikes. Some cities are moving toward dockless bikeshare, which is widely regarded as more user-friendly, but docked stations remain the default in the united states. Depending on the system and your membership status, you either swipe a credit card or insert an electronic key (containing your credit card information) at the kiosk to unlock and take a bike. Incidentally, your credit card is also the system’s primary mode of theft deterrence – if you abscond with a bike, you’re likely to be charged for a replacement. And replacement fees can be hefty – DecoBike, in San Diego and Miami, and Citi Bike, in New York City, both charge $800 once a bike is determined to be gone forever. Usually, you don’t have to return a particular bike to a specific station. Regardless of where you got it, you can bring it to any station in the network, as long as there’s an available docking space. To maintain an even distribution of bikes across the system and ensure open docks at as many stations as possible, program employees move bikes between stations by truck or trailer. By enabling effortless point-to-point riding, this encourages users to think of bike share as a legitimate transportation alternative – an efficient means of commuting, shopping, or visiting friends – rather than a mere recreational tool. Bike share programs generally have two different types of user fees – and you typically have to pay both. The first is a flat-fee membership (generally longer-term) or pass (generally shorter-term) that grants access to the program’s bikes for a specific period of time, and which you need to buy before you can start riding. The second is a usage fee based on the amount of time you actually spend on a bike. Usage fees are typically calculated in increments of 30 or 60 minutes. Generally speaking, memberships are a better deal for people who use their local bike share program regularly, while passes are better for occasional users and out-of-town visitors. In exchange for a higher upfront fee, members enjoy lower usage fees each time they ride. For example, Capital Bikeshare, in Washington, D.C., charges $85 for an annual membership, while Nice Ride Minnesota charges $75. The difference can be stark on longer rides. Capital Bikeshare charges members nothing for the first 30 minutes, $1.50 for the second 30 minutes, $3 for the third 30 minutes, and $6 for each additional 30 minutes. Nonmembers pay nothing for the first 30 minutes, $2 for the second 30 minutes, $4 for the third 30 minutes, and $8 for the fourth 30 minutes. These higher usage fees are offset by lower upfront costs – a daily Capital Bikeshare pass is $8, while a monthly pass runs $28. Regardless of whether you’re a member or passholder, usage fees for many programs can rise rapidly (Capital Bikeshare’s fee structure isn’t unusual). On the other hand, as is the case with Capital Bikeshare, programs often waive usage fees for the first 30 (and, in some cases, 60) minutes of use. The idea is to encourage relatively short point-to-point trips and reduce aimless riding with the same bike. Returning your bike to a station resets the clock on your ride, even if you immediately check out another bike from the same station. So if you want to bike for longer than the free period and don’t want to pay extra, you just need to keep an eye on the clock, familiarize yourself with nearby station locations, and pick up another bike before your free period ends. Once you return your bike, your credit card is charged for any time in excess of the free period. It’s important to note that bike share programs, particularly those run by municipalities or nonprofits, may not be entirely user-funded. Some programs tap private individuals or local companies to become station sponsors responsible for maintenance, upkeep, and repairs at one or more hubs. For instance, Target and the Minneapolis Foundation are major station sponsors for Nice Ride Minnesota. Programs might also receive grants from local transportation authorities, municipal governments, or private companies. For instance, Blue Cross Blue Shield, a health insurer, is a title sponsor – the largest single private sponsor – for both Nice Ride and Divvy, Chicago’s program. If you’re visiting a bikeshare-endowed city for a few days, the bike system is likely to be cheaper than renting a car or using public transit. For instance, a three-day bike share pass costs $17 in Washington, D.C. and $15 in Boston. A rental car in either city is likely to cost at least $25 per day, while a one-day unlimited Boston transit pass costs $12. If you can avoid incurring excessive usage fees, you come out ahead with bike share. If you’re serving as a liaison in your city for out-of-town friends, your local bike share program could be a convenient, cost-effective way to show them the sights. Unless you’re hugging the shoulder of a busy road as cars whiz by, biking is less stressful than driving or taking public transit, particularly in congested areas. And if you want to explore a spread-out park or waterfront, a bike is likely to be more efficient, particularly if parking is costly or difficult to find, or the distances are too great to walk in a reasonable amount of time. If your city has a year-round bike share program, or if you’re willing to find other ways to get around during the off-season, bikesharing could be a legitimate replacement for a personal bicycle. The cost of an annual bike share membership could be lower than what you’d spend each year on maintenance and repairs for a personal ride, depending on the quality of your bike, how hard you ride it, and how well you take care of it. If you can avoid or minimize usage fees, you could come out ahead without sacrificing the mobility and freedom that comes with having two wheels at your disposal. I admire intrepid commuters who ride their own bikes to the bus or train, hook it to the front of the transit vehicle, and then cycle from the stop to their destination – even in the hottest and coldest weather imaginable. No matter how user-friendly the bus’s bike racks or how spacious the train’s cabins, it’s still an awkward and time-consuming process. And, when you get to your workplace, you probably need a lock to make sure your bike is still there at the end of the day. By contrast, bike share programs often have hubs near major transit stops, making it easy to bike to your stop, leave the bike behind, and get on the vehicle unimpeded. Bikesharing isn’t the ideal commuting arrangement for everyone, but it’s hard to argue that it’s not useful for occasional riders. It’s an especially powerful proposition for people who don’t own their own bikes, but do enjoy pedaling around on nice days. Bikesharing is also a solid alternative to a car – if you want to visit a park or landmark on a pleasant weekend day, you can hop on a bike and get there in less time than it would take to walk, and with more freedom than you’d get in a car or bus. And bikes can go farther than gas-powered vehicles into parks and other interesting places, such as cramped historic areas where parking is difficult or impossible. This is a key advantage if you’re a fair weather biker: someone who hops on two wheels to sightsee on a few really nice weekend days per year. Whether it’s your primary mode of transportation or an occasional way to get from place to place, biking is healthier than driving or riding transit – it burns more calories, builds more muscle, and just generally makes you feel better. If you’re committed to using your local bike share program regularly, you could reduce or completely cut out those inconvenient trips to the gym, painful jogs around the neighborhood, or awkward tussles with home exercise equipment. Though there’s some variation between programs and dockless bikes tend to be sleeker, bike share bikes are often heavier (more than 40 pounds, in some cases) and bulkier than typical road bikes. They can be top-heavy as well, which takes some getting used to. As a novice bike share user, you might face an acclimation period during which you’re less confident than you are on other bikes. Some bike share programs aren’t open year-round, particularly in cold climates. This can be inconvenient, especially if you’re a traveler who expects to be able to use bike share in place of a rental car – or if you’re a commuter who expects to rely on bike share as a primary, year-round mode of transportation. Part-year bike shares can throw a wrench into value calculations too. Capital Bikeshare is open year-round and costs $85 for an annual membership, while Nice Ride Minnesota is open for roughly seven months out of the year and costs $75. Which is the better value? If you’re up for winter biking, you might be disappointed that a part-year service shuts down during the cold season – and you might have to pay more for a winter-ready bike of your own. Depending on local factors such as geography, topography, and climate, some bikesharing systems may look better on paper than they perform in practice. This is something to be aware of if you’re planning to hop on a shared bike in an unfamiliar city. For instance, San Francisco has a comprehensive bikesharing network, but it also has a ton of hills that seem a lot less charming when you’re huffing and puffing your way to the top. Chicago‘s year-round program sounds convenient until it’s time to suit up and ride against January’s bitter lake wind. Bike safety varies widely from place to place. Some cities are renowned for their protected lanes and bikeways, while others barely seem to acknowledge cyclists’ existence. You probably have a good sense of where your hometown falls on this spectrum, and can make decisions about biking and bikesharing accordingly. But without exhaustive research, it’s harder to get a sense of how bikers fare in less-familiar cities. At minimum, you should wear a helmet whenever you use a bike share, regardless of local regulations. Speaking of helmets, bike share systems don’t usually provide them at stations. While many states and municipalities don’t require adults to wear helmets on bicycles, it’s a good idea to – particularly if you’re sharing the road with cars. Of course, this is especially inconvenient if you’re traveling, as a helmet takes up valuable space in your luggage and can’t be folded down. And if you don’t own a bike helmet to begin with, buying one increases the cost of your bikesharing habit. Good helmets start at $20, and excellent ones can cost $100 or more. Though exact figures are hard to come by, bikesharing systems often have many more docks than bikes. 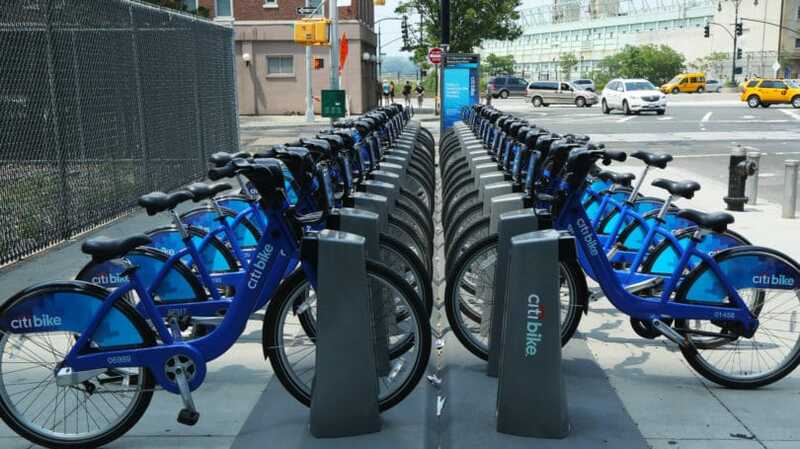 For instance, New York’s Citi Bike has two docks for every bike. And bike share employees frequently remove bikes from full or nearly full stations to keep some docks open. This makes users more likely to be able to dock their bikes, but it’s impossible to guarantee a spot every time. The likelihood of being shut out of a station rises when you’re traveling to the same destination as everyone else – for instance, a central business district on a weekday morning or a popular park on a beautiful Saturday. If you need to bike around searching for an open dock, you could accrue usage fees through no fault of your own, increasing the cost of your commute. Unless you don’t mind incurring hefty usage fees, you can’t take your bike share bikes too far outside the network’s boundaries. Depending on how extensive a program is, this limits its usefulness. Bikesharing isn’t a great option for a long, leisurely ride along country roads or rural trails. Nor is it viable for a reverse commute (from an urban neighborhood to a suburban workplace), unless the network includes farther-flung communities – and many don’t. The world’s largest bikesharing programs are found in Southeast Asia and Europe. Though it’s hard to come by reliable data about Chinese bikesharing, several Chinese cities appear to have massive bikesharing systems with more than 20,000 bikes each. The city of Taiyan, in northern China, takes the cake with more than 41,000 bikes at last count. Paris’s Vélib‘, Europe’s largest, has more than 12,000 bikes. No North American city comes close to these overseas figures, though some of the continent’s bikesharing programs are growing rapidly. However, bigger isn’t necessarily better – dense station coverage (which makes it easier to switch bikes and thus can reduce usage fees), high-quality bikes, favorable pricing, and other factors can overcome numerical limitations and make smaller programs attractive. With this in mind, here are 10 of the best bike share programs in North America, in no particular order. 1. Capital Bikeshare, Washington, D.C.
Capital Bikeshare has operated in the core of the Washington, D.C. region, plus parts of suburban Montgomery County, Maryland, since 2008. It’s administered by a Brooklyn-based private company called Motivate and receives supplementary funding from both the Federal Highways Administration and the Virginia Department of Rail and Public Transportation. Bikes are available year-round, 24 hours a day. Capital Bikeshare integrates well with the D.C. area’s public transit system – the largest bike share stations are located near Metro stations and major bus stops, making it easier for commuters to bike from residential neighborhoods to a transit line, where they can drop the bike and continue on their way. Unsurprisingly, Capital Bikeshare stations are also plentiful around central D.C.’s cultural and federal landmarks, and the organization markets heavily to out-of-town tourists. Membership and Pass Options: 24-hour pass ($8); three-day pass ($17); monthly membership ($28); annual membership ($85 when paid in full, $96 when paid in $8 monthly installments). There’s also a daily key membership option, which provides an electronic key (similar to a hotel key) that always remains in the user’s possession. The key can be activated and deactivated for unlimited 24-hour periods, providing one-touch bike access via stored credit card when active. The daily key membership’s cost is $10 for the key, and $7 per day when active. Member Usage Fees: First 30 minutes free, second 30 minutes $1.50, third 30 minutes $3, and then $6 for each subsequent 30 minutes. Passholder Usage Fees: First 30 minutes free, second 30 minutes $2, third 30 minutes $4, and then $8 for each subsequent 30 minutes. Like Capital Bikeshare, it’s well-integrated with Chicago’s transit system – the largest stations are adjacent to L stations, with smaller hubs in neighborhoods. Sightseers are sure to appreciate the numerous stations throughout the Loop and along Chicago’s trail- and park-studded lakefront. Geographical Area Served: Virtually all of Chicago’s North and West Sides, and much of the South and Southwest Sides. The network extends west and north into close-in suburbs such as Oak Park and Evanston. Densest coverage is in core Chicago neighborhoods such as the Loop and Near North. Not available on the far South or Southwest Sides as of early 2018. Membership and Pass Options: Annual membership ($99, with 15 additional minutes free on each ride); 24-hour pass ($7); monthly membership with no annual commitment ($9.95, with additional 15 minutes free); Explorer Pass ($15 for unlimited three-hour rides in a 24-hour period); single-ride pass ($3 for 30 minutes). Membership Usage Fees: First 45 minutes free, all subsequent 30-minute periods $3. Passholder Usage Fees: First 30 minutes free, all subsequent 30-minute periods $3. New York’s Citi Bike, North America’s largest and busiest bike share system, is wholly owned and operated by Motivate. As the name suggests, the service’s biggest sponsor is Citibank, whose branding conspicuously adorns each bike. Citi Bike is a bit costlier than other peer organizations, largely due to the higher costs for alternative forms of transportation in New York City. It’s especially pricey for day pass users, who pay $4 for each additional 15 minutes past the initial 30 minutes. The program is available year-round, 24 hours a day. While Citi Bike may be more convenient than waiting for the bus or sitting on a crowded train each morning, it’s a bit inconvenient that it’s only available in the city’s busiest neighborhoods. The limited geographical availability is also a problem for tourists who want to explore farther-flung parts of the city. Geographical Area Served: Most of Manhattan, much of Brooklyn, parts of Queens, and core neighborhoods of Jersey City, New Jersey. The system is in the process of a multi-year expansion that will further expand coverage in the outer boroughs. Membership and Pass Options: Annual membership ($163, with additional 15 minutes free on each ride); 24-hour pass ($12); three-day pass ($24); monthly membership with no annual commitment ($14.95, with additional 15 minutes free on each ride). Membership Usage Fees: First 45 minutes free, all subsequent 15-minute periods $2.50. Passholder Usage Fees: First 30 minutes free, all subsequent 15-minute periods $4. Pro Tip: Perhaps unsurprisingly, CitiBike has a special deal for Citi cardholders: 10% off the sticker price of an annual membership. If you’re an avid biker in the market for a new credit card, this might just grab your attention. Citi has a comprehensive lineup of cash back credit cards and travel rewards credit cards, plus two of the best low APR credit cards around: Citi Simplicity and Citi Diamond Preferred Card. Check ’em out for yourself. BIXI is the oldest major bike share system in North America. Until Citi Bike opened, it was also the largest. In fact, many subsequent U.S. programs owe their existence to the success of BIXI, and drew heavily on the Canadian program during planning and deployment. BIXI’s network is particularly dense in the touristy areas of Montreal, including Old Montreal, the McGill University area, and near Parc du Mont-Royal (though not actually in the park). Like other bikesharing programs, BIXI is well-integrated with Montreal’s transit system, including the Metro. Sadly, BIXI’s ridership dropped off somewhat after a sharp price increase in 2012, which could serve as a warning to other bike share systems not to raise prices too high or too quickly. Also, the service is only available roughly seven months out of the year – early April through early November, with exact opening and closing dates dependent on the weather. Geographical Area Served: Mostly south of Autoroute 25, east of Autoroute 40, north of Autoroute 20, and west of the St. Lawrence River, with isolated pockets in adjacent neighborhoods and cities. Membership Usage Fees: First 45 minutes free, second 15 minutes C$1.75, all subsequent 15-minute periods C$3. Passholder/a la Carte Usage Fees: First 30 minutes free, next 15 minutes C$1.75, all subsequent 15-minute periods C$3. Launched in 2010, Nice Ride Minnesota is one of North America’s older bike sharing programs. It’s heavily supported by Blue Cross Blue Shield, and is well-integrated with Minneapolis-St. Paul’s park and rapid transit systems. With reasonable usage fees, it’s a bit less expensive to use Nice Ride Minnesota for leisure riding than some of its pricier counterparts, though the station network is dense enough that finding a dock – and thus switching out for a new bike to avoid usage fees – isn’t usually a problem. Nice Ride Minnesota is in the midst of an expansion to a number of vacation towns in the region north of Minneapolis-St. Paul, with the possible goal of creating a statewide membership system for weekend travelers. Like BIXI, Nice Ride Minnesota shuts down for the winter – roughly from November to early April, depending on conditions. Geographical Area Served: Most of Minneapolis and St. Paul proper, with fewer stations in outlying neighborhoods. Membership and Pass Options: Annual membership ($75 for adults, $65 for students, with additional 30 minutes free included with each ride); 30-day pay-as-you-go membership ($18 per month, with unlimited renewals); 24-hour pass ($6); single-ride pass ($3). Membership Usage Fees: First 60 minutes free, and then $3 for each additional 30 minutes. Passholder Usage Fees: First 30 minutes free, and then $3 for each additional 30 minutes. 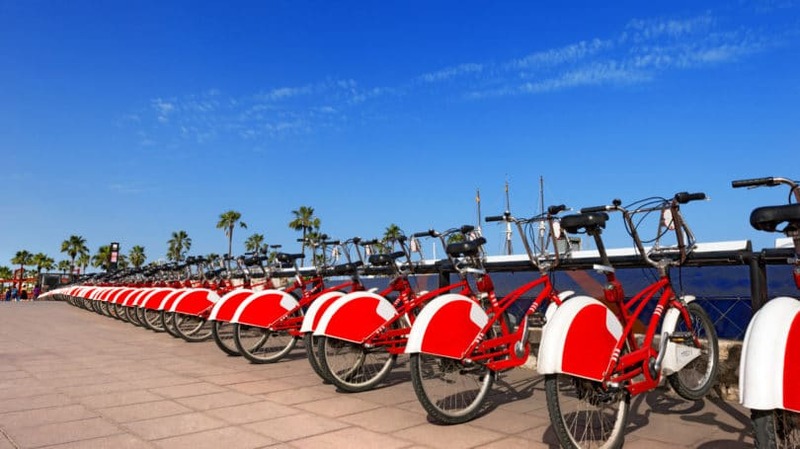 Discover Bike is the successor to DecoBike San Diego, though DecoBike (a multi-city bikesharing operator) still has operational responsibility for the system in California’s southernmost major city. Discover Bike has good coverage in core San Diego neighborhoods, though outlying districts of the sprawling city have few if any stations. Like other bikesharing programs, DiscoverBike relies on station sponsors and outdoor advertising to fill any gaps between operating expenses and user-generated revenue. It operates year-round, 24 hours a day. Though Discover Bike’s annual fees are a bit pricier than some alternatives, the three-month minimum commitment membership is useful for students and snowbirds who only live in San Diego part of the year. And station locations are ideal for tourists looking to hit San Diego’s most popular landmarks. Commuters from outlying neighborhoods may have more trouble with the system. Geographical Area Served: Downtown San Diego and the waterfront area, with clusters in and around Balboa Park, along the University Avenue corridor between the 805 and Scripps Mercy Hospital, around popular San Diego beaches, and in other busy neighborhoods in central San Diego. Membership and Pass Options: Regular membership (first 30 minutes of every ride free – $99 annual fee or $20 monthly fee with three-month minimum commitment); deluxe membership (first 60 minutes of every ride free – $199 annual fee or $30 monthly fee with three-month minimum commitment); 30-day membership ($50); seven-day membership ($35); two-hour access pass ($12). Membership Usage Fees: First 30 minutes free (deluxe members get first 60 free), and then $5 for each additional 30 minutes. Hourly Rental Fees: First 30 minutes free, and then $5 for each additional 30 minutes. Pro Tip: Discover cardholders are entitled to 20% off annual memberships with Discover Bike. My personal favorite is Discover it Card, a no-nonsense cash back credit card, but Discover it Miles is a popular choice for frequent travelers. DecoBike also operates a popular bike share program in its hometown. Confusingly, DecoBike Miami is heavily sponsored by Citibank and is co-branded “Citi Bike Miami” – the bikes look more or less identical to New York’s Citi Bikes. Another confusing element of this Miami-area bikesharing program is that despite identical-looking bikes and a single regional membership system, the Miami and Miami Beach branches are administratively separate. The system won’t allow you to dock a Miami-based bike in Miami Beach or vice versa. Aside from these unusual considerations, this program is easy to use and covers many of the major tourist hotspots in the Miami area. Relatively affordable hourly rates are nice for visitors, though annual membership fees are on the steep side. Operation is year-round, 24 hours a day. Geographical Area Served: Roughly the southern half of Miami Beach and central Miami between FL-112, I-95, and FL-913. Membership and Pass Options: Regular membership (first 30 minutes of every ride free – $15 monthly fee with three-month minimum commitment); deluxe membership (first 60 minutes of every ride free – $25 monthly fee with three-month minimum commitment); 30-day deluxe membership (first 60 minutes of every ride free – $35, with no commitment). Membership Usage Fees: First 30 minutes free (deluxe members get first 60 minutes free), and then $4.60 for each additional 30 minutes. Hourly Rental Fees: $4.60 for each 30-minute period beyond the initial rental term. Overseen by the Metropolitan Area Planning Council and the various cities it serves, Hubway is operated by Motivate and funded by a variety of private and public sponsors. Hubway stations are plentiful near T stations, particularly along the Red and Green Lines, near Boston‘s water features, and in centrally located tourist districts. In served areas, the dense station network makes the system ideal for commuters and tourists despite somewhat steep pricing. Though most of Hubway closes during the winter (roughly mid-November to early April), the Cambridge stations remain open through the winter if conditions allow. Geographical Area Served: Central Boston, including the Back Bay, Financial District, Beacon Hill, and the North End. Also located in Cambridge, Brookline, and Somerville. Membership and Pass Options: Annual membership ($99); monthly membership ($20); 72-hour membership ($15); 24-hour membership ($8). Membership and Passholder Usage Fees: First 30 minutes free, second 30 minutes $1.50, third 30 minutes $3, and then $6 for each additional 30 minutes. Denver‘s bike share program is operated by B-cycle, a multi-city, public-private bikesharing partnership orchestrated by the Trek Bicycle Corporation, Humana (an insurer), and Crispin Porter + Bogusky (an advertising agency). Despite Denver’s sometimes harsh weather, Denver B-cycle operates year-round, 5am to midnight. The program covers Denver’s most densely populated and tourist-friendly areas, though outlying business districts like the Denver Tech Center aren’t served. Stations are particularly plentiful in the central business district, near transit hubs like Union Station, and around event destinations like the Pepsi Center and Coors Field. It is worth noting that given the meager price difference between annual and plus memberships, the latter might be a better deal. Also, since usage fees are relatively low, Denver B-cycle is one of the better bikesharing programs for leisurely riding. Geographical Area Served: Central Denver, mostly east of I-25, south of MLK Boulevard and Ballpark neighborhood, west of Colorado Boulevard, and north of Alameda. A small, somewhat isolated cluster exists near the University of Denver. Pass Options: All Denver B-cycle memberships are called “passes”: Regular annual membership (first 30 minutes of every ride free – $95); “Plus” annual membership (first 60 minutes of every ride free – $135, including access to other B-cycle cities); 30-day membership ($15 per month, automatically renewed, with a six-month commitment required); 24-hour pass ($9); unlimited 24-hour pass ($35). Usage Fees: First 30 minutes (60 for “Plus” annual members) free, all subsequent 30-minute periods $5 (except for unlimited 24-hour passes, which confer unlimited biking privileges). Pro Tip: You can’t get up into the Rockies on a Denver B-cycle bike, but you should definitely devote part of your Colorado vacation to exploring the high peaks west of town. If you have a few days to spare, check out two oft-overlooked mountain towns: Steamboat Springs and Grand Lake. Use our guide to lodging in Grand Lake, Colorado, to find affordable places to stay in that area. Then, check out our roundup of the top things to do in and around Steamboat Springs, Colorado. Don’t be fooled by snow on the high peaks – these are true four-season mountain towns. Thriving bike share programs aren’t just for populous cities and well-established tourist destinations. With supportive local governments and enough members or paying riders, these programs can thrive just about anywhere. Chattanooga, a smallish city in a picturesque Appalachian valley, is living proof: Bike Chattanooga is the largest in the Southeast, despite serving a population that’s just a fraction of the size of Atlanta’s, Charlotte’s, or Nashville’s. Bike Chattanooga is operated by Motivate and overseen by the City of Chattanooga Transportation Department. It’s particularly useful for visitors who want to explore Chattanooga’s riverfront tourist area and nearby central business district, though students at the University of Tennessee and commuters who live in close-in neighborhoods can definitely take advantage as well. Bike Chattanooga is available year-round, 24 hours a day. Geographical Area Served: Downtown Chattanooga, the University of Tennessee at Chattanooga, and the riverfront area, with an isolated hub near Tennessee River Park. Membership and Pass Options: Annual membership ($50); three-day pass ($15); 24-hour pass ($8). Special memberships and passes may be available on a case-by-case basis for special events, such as conventions, through the local convention bureau. Usage Fees (Membership and Pass): First 60 minutes free, and then $5 for each additional 30 minutes. One of the nicest things about my Minneapolis neighborhood is its proximity to a Nice Ride Minnesota station – one of several, actually. Around here, the reappearance of those distinctive blue-and-green bikes is as sure a sign of spring as the first flower or whiff of fresh-cut grass. And each spring brings more bikes, stations, and users. In some parts of town, it feels like Nice Ride Minnesota users outnumber traditional cyclists, and I’m sure the situation is similar in other cities with popular bikesharing programs. While bikesharing can be a legitimate transportation alternative for some, it doesn’t always make sense for everyone. Whether it’s cheaper or more convenient than actually owning a bike depends on many factors, including your location relative to bikesharing stations, your local program’s pricing, what type of bike you own, and how religiously you maintain it. It’s up to you to crunch the numbers on your local program and make the right call. Does your city have a bike share program? Do you ever use it?